Hands down, peanut butter is one of my favorite things to eat. So it’s no stretch for me to get on board with celebrating a day dedicated to one of my favorite uses of peanut butter: cookies. Today, June 12, is National Peanut Butter Cookie Day, and I baked off a batch of my favorite peanut butters cookies to celebrate. What I love about this recipe is the simplicity. There are just 4 ingredients, so the cookie comes out with pure peanut-y flavor. If you make the recipe a handful of times, or if it’s on a serious rotation at your house like it is here at the bungalow, you’ll be able to whip up a batch from memory. 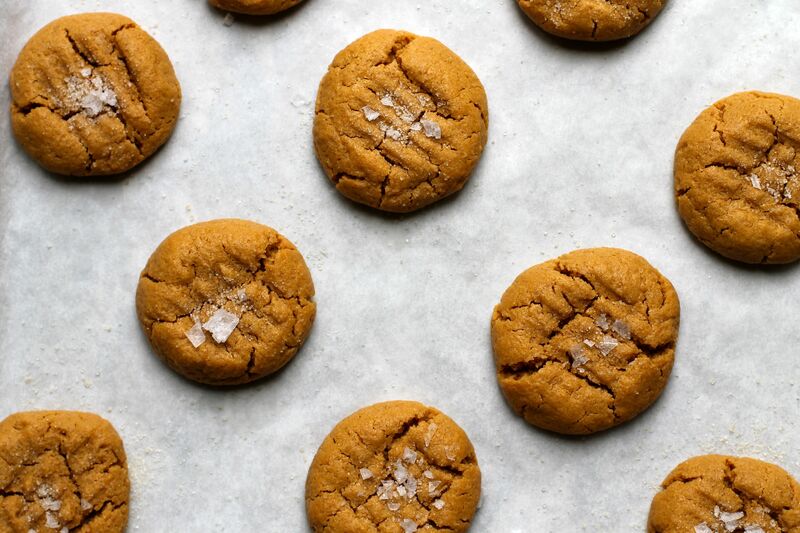 And as if you needed yet another reason to bake peanut butter cookies, this recipe can be mixed up in a regular bowl, with a fork, and then plopped onto a baking sheet, no other equipment required. No pulling the mixer from the depths of the bottom cupboard, no sorting through a mountain of measuring spoons, no sink-full of dishes…this one is so easy you can mix it up at a moment’s notice and have fresh-baked cookies mere minutes later. Variations of this recipe can be found all over the internet, but I use the one from one of my favorite cookbooks, The 150 Best American Recipes. The original recipe came from Gourmet magazine, which was one of my favorites until it was shuttered a couple of years ago. However, I have tweaked it a bit, so please read on for the recipe and for a couple of additions that I think you’ll like. And if you’re feeling in a particularly peanut butter-y mood, click forward to the National Peanut Board for more fun facts!